Shanghai Village is in Arlington center, making it convenient for a pre-bridge game bite. Nate and I were seated immediately at 5:30pm. The Chinese restaurant has been around for ages but last fall they closed for renovations and added a new sushi bar. There is a banner advertising their "Grand Re-Opening!" I was there once, in 1999, I remember it serving average American Chinese food. Nate had a Groupon to use, specifically for the sushi menu, so I had the chirashi ($18). The word "chirashi" means "scattered," and is basically any assortment of fish and vegetables on top of a bed of sushi rice. It's like lazy man's nigiri. 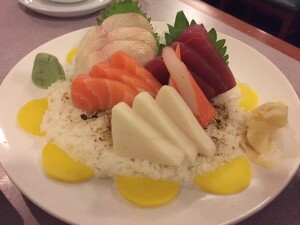 My version came with salmon, tuna, escolar, hamachi and imitation crab meat. The sushi rice was seasoned correctly and was even the right temperature. The fish was cut well, but the tuna and escolar were watery and bland. Nate got the Spicy Roll Combo ($18): spicy tuna, spicy salmon and spicy yellowtail. Despite the "spicy" title, Nate deemed all the rolls bland. He did not finish his meal. There were only 2 waitresses and they were harried. We had to wave her down each time we wanted more water, more diet coke, or the bill. Luckily, the Groupon gave us a $12 discount; the prices are high for the quality of what you are getting. It might be another 17 years before I return.